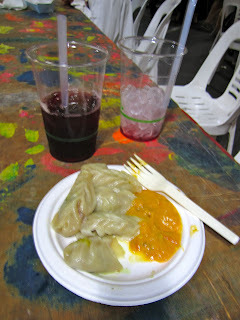 Last week we remembered that the summer season Night Market at Queen Victoria Market was starting. I didn't really know what to expect. I guess I thought that it would be similar to the regular market... just darker? It was fantastic!! There were heaps of people, amazing variety of food, and lots of little shops full of delightful handmade goods. Kangaroo Burger. Really dense meat, but not too bad! Today I am thankful for discovering something unexpectedly fantastic. There could be an adventure right around the corner, you just have to have enough energy to go out and look for it. WOW! Those dumplings and the burger look amazing!